Long-term leases are now being signed by major corporations, as rents are being discounted 30% to 50% off the all time highs. This is not true for smaller tenants, as downsizing has increased demand and there is less small office space in the market due to building conversions and former building repositioning for larger tenants. There were extraordinary amounts of pop up (temporary) stores this holiday season, which means fewer long-term leases were being executed. New leasing velocity improved in Manhattan last month, average asking rents continued to fall. Leasing activity rose to its highest level in three months to 1.78 million square feet as landlords dropped average asking rents last month by $0.73 to $49.17/RSF. The highest vacancy rate in Class A buildings in Midtown was in the Columbus Circle submarket at 17.6 %. In Midtown South, the neighborhood with the highest Class A vacancy rate was Chelsea, at 19.4 %, and Downtown, the Financial District had the highest rate, at 10.9 %. In Manhattan office buildings, Class A asking rents were $59.72 per square foot in November, having fallen from above $80 per square foot at the same point last year. The latest reports from the city's commercial brokerage firms show continued slippage in Manhattan office leasing, and those mixed signals make it difficult for brokers to agree on what advice to give their clients. At the start of the crisis, firms counseled tenants to hold off on making deals, but that stance has softened recently, and the company believes low-priced space can be had at attractive pricing. Whether we are at the bottom of the market or really close to it, we feel we are close enough where the quality of the deals we can get probably outweigh any possible further benefit. The vacancy rate for Class A office buildings in Manhattan last month reached its highest level since April 1997. There is a continued softness in Manhattan office leasing, but no improvement in some areas, including a small uptick in asking rents in Midtown South. 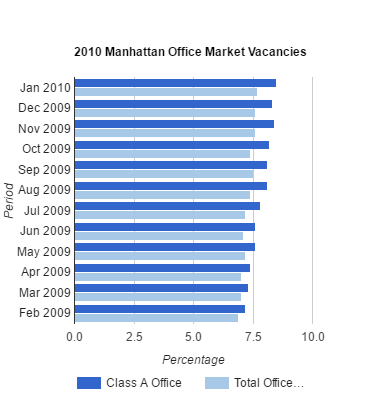 Manhattan Class A vacancy rate reached 12.2 %, the highest since April 1997 when it hit 12.8 %. For all classes of buildings in Manhattan, the vacancy rate was 15.5 %, up .1 points from the month before. At the same time, average asking rents fell $0.28 per square foot to $50.63 per foot. Even with a 25 percent decline in rents over the last year, New York City still has the priciest retail market in the world. So-called "prime" New York retail rents” are $1,640 per square foot, with Hong Kong and Paris coming in as the second and third most expensive locations. Prime rents in premier locations are showing signs of stability as the best locations in the best markets continue to attract a variety of retailers. Nationwide, retail real estate inventory climbed slightly between the second and third quarters of this year, the industry is stronger than the office and industrial sectors, and that low interest rates and government spending have helped aid the retail market recovery. The anemic pace of major retail leasing in the five major Manhattan retail submarkets scored just one deal over 10,000 square feet this year, compared to 11 across the same five submarkets in 2008. Raymour & Flanagan signed a lease for 30,000 square feet in August and brokers say tenants are finally looking around, after almost zero activity in the first half of the year. There is a signed commitment from a tenant for 16,500 square feet of corner and second-floor space at 666 Fifth Avenue, perhaps the most prominent of a slew of major flagship vacancies across Manhattan.